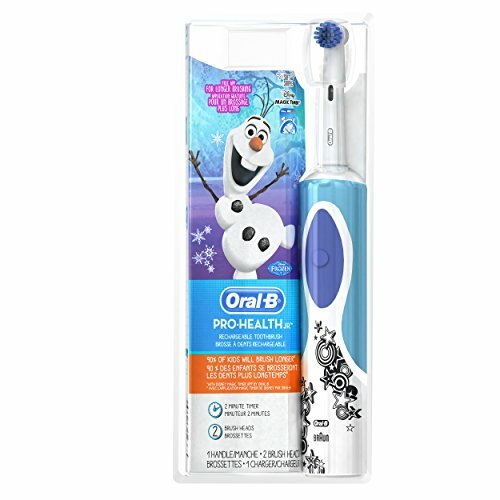 If you are short of time, the answers to the following 3 questions should let you know all you need to about the Oral-B Pro Health Jr Disney Frozen Vitality Power Toothbrush. If I have missed something, let me know in the comments. If you want more detail, you can read our full Oral-B Pro Health Jr Review further down the page. No, for the money it is a pretty decent electric toothbrush, designed for kids. The Pro Health Jr has several desirable features that encourage children to brush for the right amount of time and take better care of their teeth. It’s worth noting that various online listings don’t mention “Pro Health Junior” in the product title (although it is visible on the packaging) and instead refer to it as “Oral-B Kids Electric Rechargeable Power Toothbrush”. The buying options we include on this page are indeed for the Oral-B Pro Health Junior. The Oral-B Stages Power is an alternative option to this brush, but really the best alternative you can consider is the Sonicare for Kids Connected toothbrush. The Sonicare takes the brushing experience to a whole new level and sets a standard no other kids toothbrush has beaten to date. For a more detailed comparison of buying options, see our best electric toothbrush for kids post. 3. Where’s the best place to buy the Pro Health Jr? Typically we tend to recommend Amazon because it is very competitive on price and has special offers running. It also offers free delivery. However, it’s always worth checking out other retailers as well. Check the links below for the cheapest price for the Oral-B Pro Health Junior amongst US retailers. It’s always worth checking eBay too. The Oral-B Pro Health Jr has been designed with children in mind. Unlike a regular toothbrush adults might use, these have been adapted to appeal to the younger audience with bright colors, interactive options and some of their favourite characters from TV and film. It is the Disney Frozen themed brush that I am reviewing here and it is to, the one that most retailers sell. It does get a little confusing, but different retailers give it different name variations which might lead you to believe it is a different brush. What are the pros and cons to this kids electric toothbrush? Timed Clean – A 2 minute timer is built into the handle. Design – The tapered profile of the brush makes it easy to hold, but he bright colors and ‘Frozen’ theme makes it more engaging for kids. Design – Could have perhaps had more theme influence to the handle than there is. There are 2 key parts to the Pro Health Jr from Oral-B. There is the brush handle, that contains the rechargeable battery and motor. And there is then of course the detachable brush head. The handle and head work together to offer a great clean to the teeth of children (and adults). This Pro Health Jr is the same shape and feel in hand as the Oral-B Vitality for adults. However, this brush has had a bit of extra design flair added to it. Children should find this more appealing and engaging and it is just one part of the puzzle to help get them brushing for longer. The brush handle itself has a tapered design. It is thinnest at the bottom and gets wider/thicker to the top of the handle, where the brush head attaches. The shape moves from a round/cylindrical shape to almost oval by the time you reach the neck of the brush. It will stand upright on a worktop if you want it too. On the base of the brush is a recess into which the prong on the charging stand fits. More on the charging stand in the ‘battery life’ section of the review. The front of the handle is mainly a smooth touch plastic but is accented by the large rubber grip around the power button, the one and only button on the handle. On the rear of the brush handle, but wrapping around partially onto the front, is a large grip. The rubber is a Turquoise color and has a series of ridges on it, which the fingers catch on to allow a firm grasp of the brush. The sizing works well for children’s hands to hold onto and the extensive grip should mean that for the most part its held securely, even when wet. Towards the bottom of the brush handle, on the front, is a small Oral-B/Braun logo whilst regulatory icons adorn the same area on the rear of the brush. Normally, there would be a battery status icon/LED, but sadly the Pro Health Jr does not have this. A small rubber protrusion on the neck of the brush handle at the rear helps the brush stay in one place if laid flat on a worktop. At the top of the brush handle is a metal shaft that is attached to the motor sealed inside the handle. It is to this that the detachable brush head attaches. There are 2 brush heads provided in the box with this brush. That is quite surprising given the price. The heads simply slide on and off and should be changed every 3 month’s, or sooner if the bristles are frayed or show signs of wear. If you are not aware, a very neat feature that Oral-B work into their brush heads is something known as indicator bristles. Blue bristles within the head will fade over time (approx 3 months) from a strong Blue to pale Blue/translucent color. When they have lost the color it is time to change the brush head (if not sooner) It is a visual clue and reminder to you. It is all too easy to forget when the head was replaced. Sensitive brush heads come supplied in the brush and these are certainly the ones you should stick with for children. Ultra soft bristles are gentle on the teeth and gums, but the movements from the brush motor allow 7,600 oscillations per minute to give a thorough clean to your kids teeth. There is just 1 cleaning mode,not differing modes or speeds as is the case on some brush handles. Compared to a manual brush, these bristles are going to pass over the tooth surfaces a lot more and increase the chances of sweeping away bad bacteria. There is differing opinion as to what age your child should be when using the brush. You should supervise them until the age of about 7 years old, but children aged 3+ can use this brush. You may choose to delay them using this if the brush head is a little too big for their mouth. Replacement brush heads can usually be purchased in packs of 3 and often work out at about $5 per head. Brushing for 2 minutes twice a day is the recommendation of dental professionals, but to a small child, minutes can be like a lifetime! The Pro Health Jr from Oral-B has a couple of features that will hopefully help. First there is the ‘Disney Frozen’ them to the brush handle. It is better than nothing, but it would be nice if there was a splash more colou and slightly different graphics to engage children. There is then too a timer built into the handle. The timer begins the moment the power button on the handle is pressed. It runs for the suggested 2 minutes. However, whilst its not built into the brush, it is built into the app. The thought of having a smartphone in the bathroom when your kids brush might fill you with dread, but there are positives to come of this, let me explain. The Disney Magic Timer is pretty clever in what it does and what it offers. Once loaded on the phone, from within the app, you scan the brush/packaging using the phone’s camera and it intelligently detects what theme to apply to the app. In this case a Frozen theme. Ideally the phone needs to be positioned in a way that child can see the screen whilst keeping the device away from danger. Some sort of holder would be nice, but this is not included. Of course the results of this brush vary from child to child and how motivated they are by this sort of approach. Our own hands on testing suggests that most children love this and find brushing much more enjoyable and more importantly, brush for longer. Oral-B claim you get 5 day between charges. This is a total of 20 minutes running time, based on a child brushing twice a day for 2 minutes. In my hands on testing I achieved double this. Why, I am not sure. I managed a total of 44 minutes of usage time from the brush, which is equivalent to 22 cleaning sessions or 11 days of usage time. Perhaps not all brushes are created equal?! What I suspect this means is that the minimum usage time will be 20 minutes and there is a very good chance you will get longer from it. However, I can’t be assured you will get the same experience and although more expensive, the likes of Sonicare’s brushes offer a minimum of 14 days, that is a reasonable improvement. As a parent you have enough things to juggle and checking the toothbrush is charged is just another thing to add to the list, so if the runtime is longer than 20 minutes, then great. You might want to teach the kids to put the brush on the charging stand after every clean if possible, then you need not worry. It is perfectly safe to leave the brush sat on the stand that comes supplied, so it is always topped up. A battery status icon would also be useful to show if there is 80%, 20% or 10% left, but sadly no such indicator is available. Unlike the longer lasting Sonicare alternative that has a Lithium-Ion battery, the Pro Health Jr has a Nickel Metal Hydride battery. It does the job and allows the brush to come in at the price it does. Personally I would pay a few pounds more for extra battery life, but I can’t really grumble with what you get for the money. The charging stand supplied is White in color and has a US power adapter. If you travel with your kids, you might need to think about what you do, particularly if travel is international where voltages tend to be different. If the brush is completely flat, it will take up to 16 hours to charge it fully. The actual price you will be asked to pay for this brush does depend on the retailer you are buying it from. We have included a live price comparison for the Pro Health Jr here. The best prices are typically online, with a price as low as $20. Pop into a grocery store like Walmart and you can expect to pay around $30. Whilst $20 is of course better than $30, when you consider what you get, the brush, 2 brush heads and a charging stand that is pretty reasonable. Brush heads need to be replaced every 3 months on average and they will normally cost about $5 each and come in a pack of 3. Using the average cost and ownership over 3 years, the Pro Health for kids electric toothbrush will cost $75 ($25 for package + 10 brush heads at $5 each) or $0.07 per day to own. All told I think this is a very fair price for what you get. As one of the leading brands within the electric toothbrush market you can expect the Oral-B Pro Health Jr Vitality to be well built. We have our experience and knowledge of other brushes to make comparison and comment on. The overall build quality and construction of the brush is very good and this is thanks in part to Oral-B’s tried and tested approach and refinements over the years. The weakest point is the battery. After repeated charges and discharges it can fail and should it, they are not easy to replace. But, by the time this happens, you will likely have gotten your value from the brush. Backed by a 2 year warranty, should something go wrong, it can be returned for repair. Although in truth, the cost is so low it might not be economically viable. A few weeks is not really long enough to say how well it will stand the test of time, but all Oral-B brushes go through a strict quality control programme. Every parent can likely relate to the struggles of teaching their kids to brush their teeth properly and regularly. Our children are lucky enough to be exposed to many great educational resources and the challenge to win their attention is now harder than ever. The Frozen theme to this brush and the accompanying app go a long way to help them on their brushing journey. It makes brushing interactive and fun. Although there are some limitations to this model, notably the lack of Bluetooth connectivity to the app, no quad pacer and no battery status icon, what you get is pretty good value. For those willing to spend a bit more and invest for the long term, Sonicare Kids Connected brush is well worth your consideration. Is the Pro Health Jr an oscillating brush? This is the comprehensive everyday cleaning mode that works with the provided Sensitive brush head to effectively clean the teeth using the Oral-B 2D oscillating and rotating technology to clean the teeth and remove up to 100% more plaque than a manual brush. With the brush you get one of Oral-B’s Sensitive brush heads. The brush handle is compatible with the full range of differing brush head styles from Oral-B which include Cross Action, Floss Action, 3D White, Sensitive, Precision Clean and DeepSweep. It is however best to stick to the Sensitive brush head for kids. Does the Pro Health Jr have a pressure sensor? Does the Pro Health Jr come with a warranty & how long is it? If purchased new from an approved retailer the Pro Health Jrr will come with a 2 year warranty. Does the Pro Health Jr have a built in timer? Yes, a charging station is included with the Oral-B Pro Health Jr. The Pro Health Jr charging station has not been designed to be fixed to a wall. Can I use the Oral-B Pro Health Jr in the shower? Do you own or have your children used the Oral-B Pro Health Jr?